Great journal! Exactly what I need and expected! It's National Infertility Awareness Week. Did you know 1 in 8 couples struggle to get pregnant? That's 7.4 million people. Many couples go through IVF to get the child they long for. If you are one of those going through IVF, this journal is for you. Mother's Day is right around the corner. This is the perfect gift for a first time mommy...or someone who's going to be a mommy again. Use the code in the last post to get 15% off. Order by Monday to guarantee delivery by Mother's Day. If you are struggling with infertility, for whatever reason, you are not alone. So many couples struggle with conceiving. Thanks to medical advancements, many couples are able to have children. 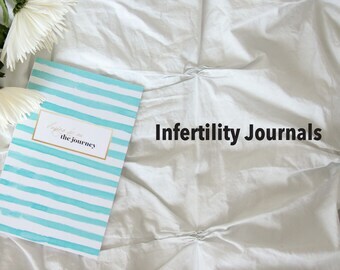 This IVF journal was created to document your IVF journey. Paperlust Studio is a small design shop. Behind the shop name is Colette Sutton. I have a love for all things design, whether it is an invite, a piece of furniture, or a building. Paperlust Studio became an idea when I was pregnant with my twins, Marshall and Madison, in 2013. I wanted to record my memories and photos so I could one day share them with my kids when they are older. 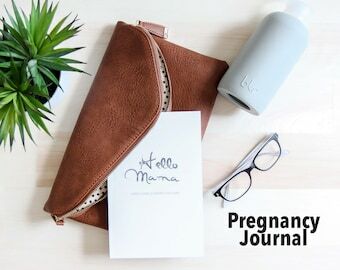 I couldn't find any pregnancy journals that allowed me to record what I wanted that were also aesthetically pleasing. I created my own journal on my computer. The problem with technology is that so many things are done on the phone or computer, but they never seem to leave the hard drive. I am guilty of this myself. This inspired me to create journals that were visually stunning but also functional. If you receive a damaged item, I will replace your item free of charge. If you are unsatisfied with your product, please contact us at support [!at] paperluststudio.com so we can try to fix the problem. Your satisfaction is our main concern. All orders are processed 1-3 business days after an order has been placed. All orders ship via Standard USPS which takes around 6-8 business days to ship. You have the option to pay an additional fee to have your order shipped faster. You will receive a tracking number once your order has shipped. Can I change the cover? Unfortunately, no. The covers are preprinted and cannot be changed. Will you write a personal note if I send this as a gift? Yes! Either send me a message or leave me a note on your order telling me what you would like the note to say. And, I'll do it for FREE! I know this is a great gift to give to a new-to-be mama and I would love to send it to your friend. I am now offering wholesale ONLY on the perfect bound books. If you are interested in the perfect bound books wholesale, send me a message.